The stylish ZOO (Zone Of Occupancy) Fan de-stratifies by producing a gentle, concise column of air that draws warm air from the ceiling and forces it down to floor level. By doing this it helps create a more pleasant and comfortable indoor environment for workers and customers. It can also help to lower a building's operating costs by reducing the energy consumption of a heating system in cooler weather. Available in 2 sizes, 250mm and 300mm. Ideal for buildings that are heated and have high ceilings such as warehouses, airports, churches, school halls, green houses, and shopping centres. Particularly effective when used in aisles because of their narrow band of air and variable speed control motor that provides air flow adjustment. 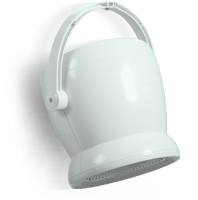 Can be also used as a quiet and unobtrusive cooling fan in warmer weather. Helps create a more productive, more comfortable environment that has the potential to reduce energy consumption. Can be installed so its air flow avoids or targets areas. Adjustable air flow using a VA speed controller. Model with finger guards on inlet and outlet available (See special note). Codes: ZFH30G, ZFH60G.